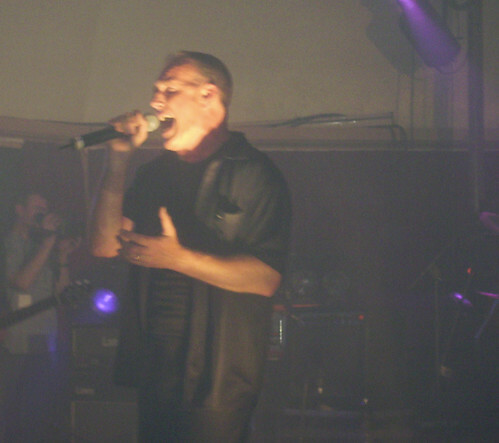 Richard Jobson, originally uploaded by alister. Thirty years since they first played together legendary punks The Skids have got back together to mark the occasion. Sadly key member Stuart Adamson, who wrote much of their music and went on to form Big Country, died five years ago after a battle against alcoholism. But the surviving members gave it their all in front of a highly partisan and enthusiastic crowd. Singer Richard Jobson was looking good and had clearly spent some time in the gym. The tunes were spot on and very loud as the deafness in my right ear testifies. From the opener 'Animation' they brought to life songs which really have not aged at all. The success of the U2/Green Day cover of Skids tune 'The Saints are Coming' is testament to this. Highlights included Into the Valley and Masquerade and of course set closer 'TV Stars' which had some interesting new lyrics about TV chef Gordon Ramsay attached. The only criticism I would have would be the repetition of songs in the encores, clearly it was only possible to rehearse a certain number of tunes. The audience were left deaf, soaked in sweat and buzzing and you can't say better than that. sloop john b/into the valley. And some other folks youtubery (funnily enough the same songs I captured) can be found here and here.